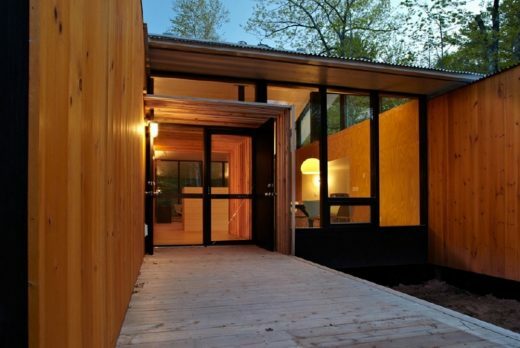 Week’nder opens and closes, its façades shifting from dark and opaque to light and transparent as you walk around it. 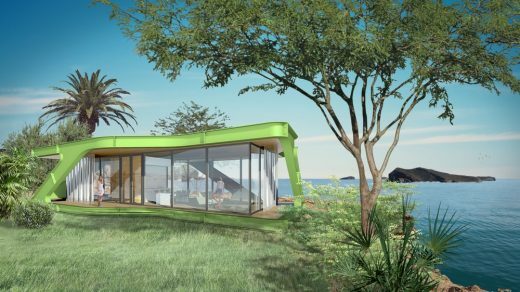 The design and construction of this weekend getaway were driven by its island site: two prefabricated modules fit on trucks to come over by ferry, posts minimized foundation concrete, and bottle jacks eliminated the need for a crane. 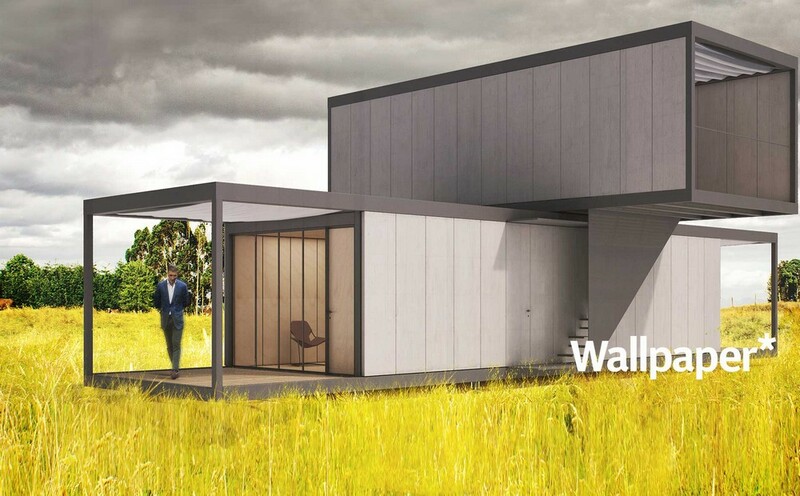 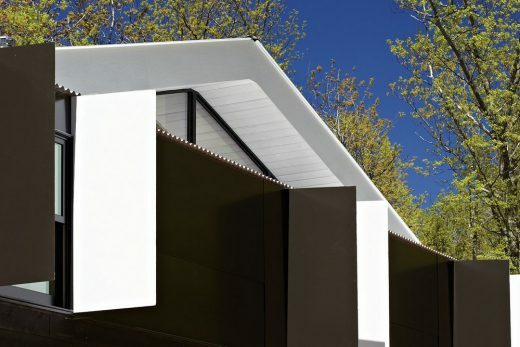 Containing the kitchen, three bedrooms, two bathrooms, laundry, and all of the infrastructure, these parallel modules set a datum line above which the gabled roof of a shared, site-built “dry space” rises like a tent. 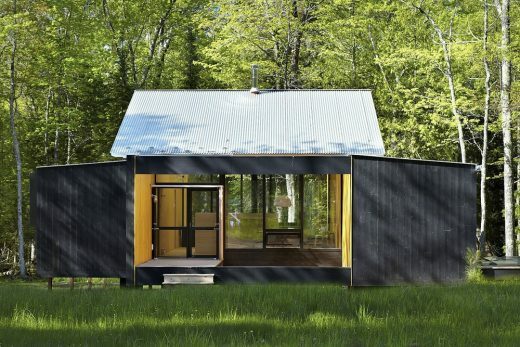 Materials at hand—plywood, pine, and corrugated and smooth metal—lend the cabin a rustic feel balanced by a precise coordination of colors and textures. 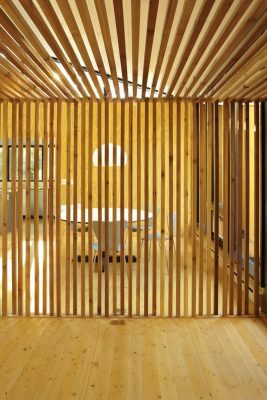 Nature drifts in along a gradual entry walkway punctuated with a screen of thin wood posts. 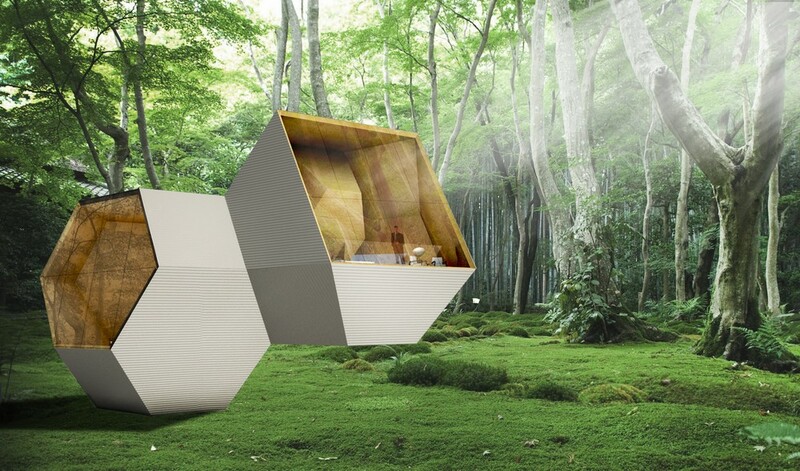 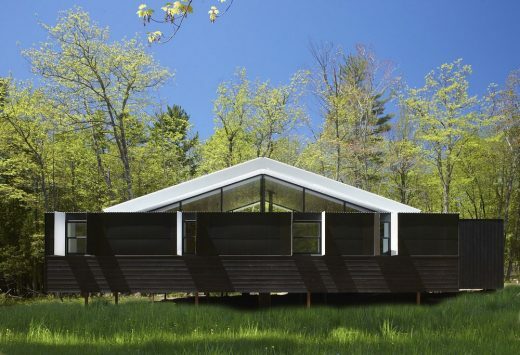 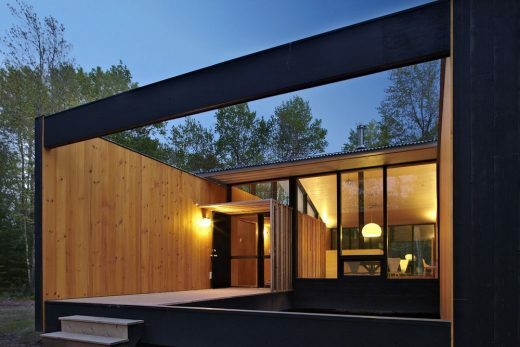 A screen porch extends one module, offering a unique view into the woods. 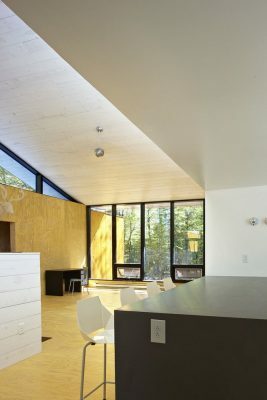 Floor-to-ceiling windows open the main living space to the cabin’s surroundings at either side. 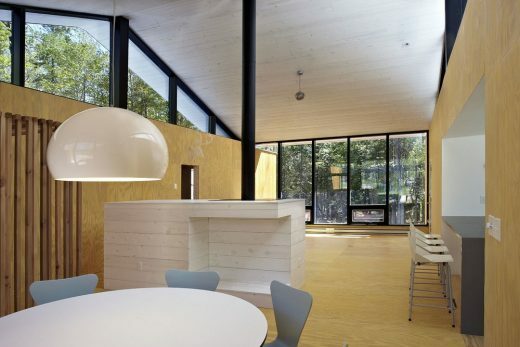 An open plan unites the array of surface qualities that animate the exterior, clarifying their connection. 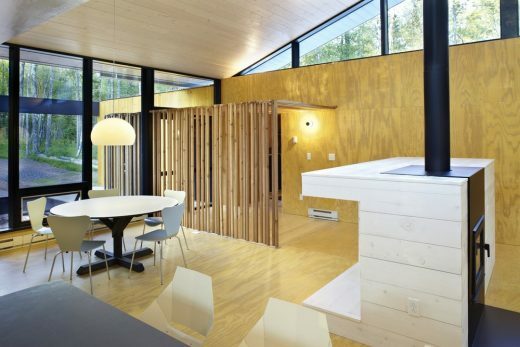 Between the module walls and the cathedral ceiling, clerestory windows bring in light. 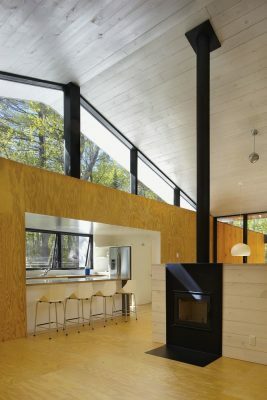 A fireplace and counter rise up from the wood floor while the white-walled kitchen and sleeping bunks are carved from the plywood modules. 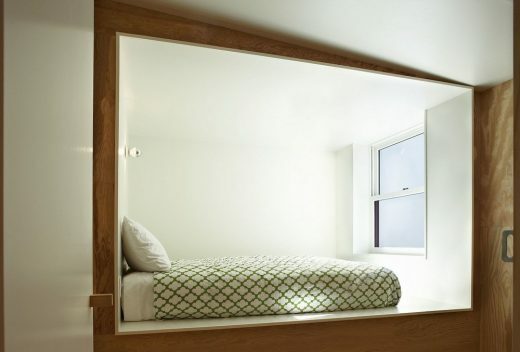 Continuing out from the thickened bedroom walls, metal window fins are white inside so the bunks are filled with glowing light. prefabricated modules fit on trucks to come over by ferry, posts minimized foundation concrete, and bottle jacks eliminated the need for a crane. 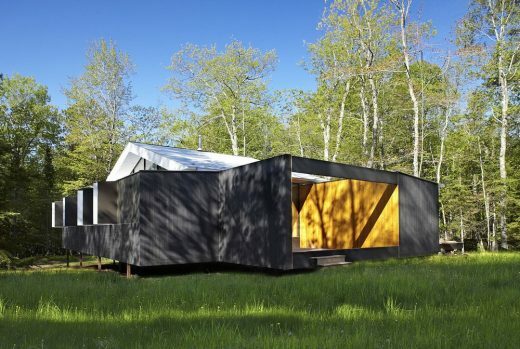 Containing the kitchen, three bedrooms, two bathrooms, laundry, and all of the infrastructure, these parallel modules set a datum line above which the gabled roof of a shared, site-built “dry space” rises like a tent. 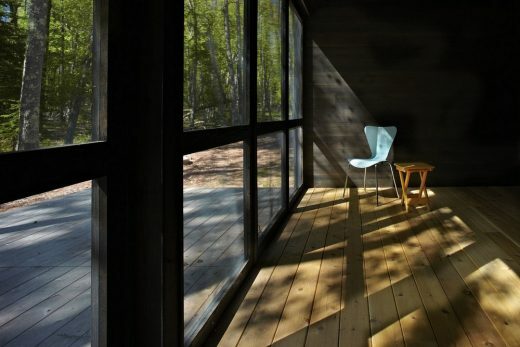 The week’nder is a weekend retreat, programmed to offer spaces of repose and quiet, interwoven with the outdoors through a series of screens. 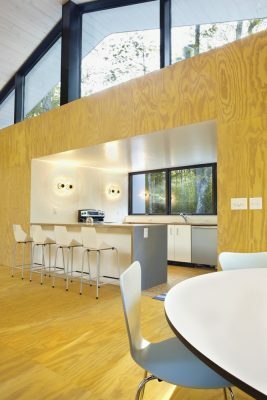 Site specific materials -plywood, pine, and corrugated and smooth metal- lend the cabin a rustic feel balanced by a precise coordination of colors and textures.